an excerpt from our new Genealogy Gems Book Club interview, which will appear in full later this month in the next Genealogy Gems Premium podcast. Genealogy companies are getting smarter, there’s no doubt about it. The latest smart-searching feature from MyHeritage.com is one great example. MyHeritage recently released Search Connect ™. This is new technology that helps you find others who have been searching for the same rare surnames that may be on your family tree. Here’s how it works. For several years, MyHeritage has kept a database of who is searching for what ancestors. I can only imagine how huge that database is! They have now put that database to use as a social networking tool. They whittled it down, at least for now, to just those folks searching for rare surnames. Just that database has 30 million names in it! Now when you search for those rare surnames in the SuperSearch area of MyHeritage, results from the database of other searchers are included in your search results (and they even get translated if needed, thanks to MyHeritage’s Global Name Translation tool). You can click to look at their larger search history to see if this is really a match for you, then contact them through the site. You can also search on that database separately here. Recently we ran a contest celebrating our milestone 1000th blog post on the Genealogy Gems website. We counted down our Top 10 posts of 2015 and many of you helped us share those posts on Facebook. Charles Meiser was one person who helped, and he won a copy of the Video course Pain-Free Family History Writing Projects by our very own Contributing Editor Sunny Morton. 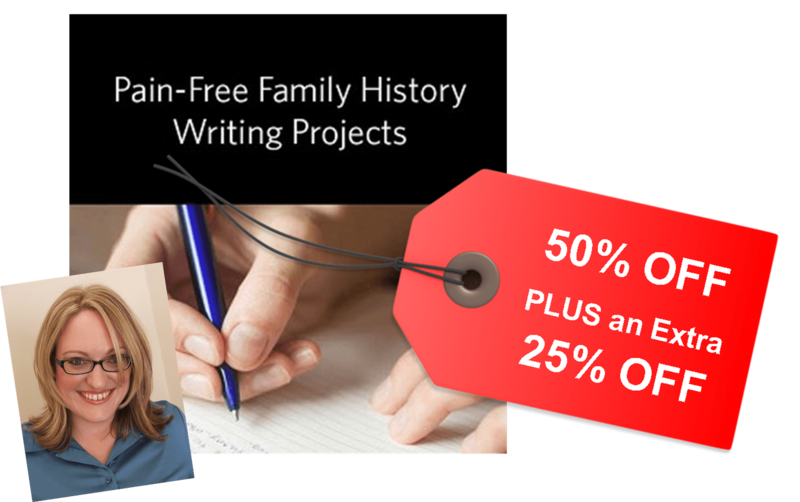 I do have a nice consolation prize for those who didn’t win: a coupon code for 25% off your own copy of Pain Free Family History Writing Projects Video Course . Her class is packed full of strategies to help you finally get your family history written. And her approach really helps you think outside the box about what really constitutes family history writing. She shares some fun and fantastic ways of passing along your family history without writing a 300-page volume. A few months ago I was interviewed on the Write of Your Life podcast. The thrust of what I talked about was the importance of what I call “family founders,” those people we can look to in our tree for inspiration and think of as role models. Family history helps modern families grow and heal. The people we meet on our family tree—people with the same genes we have—inspire and teach and motivate us in ways they never could have imagined, and maybe we never could have, either, until we “met” them. Click here to listen to the interview. And then I’d love to hear from any of you about how family history has meaning in YOUR life. 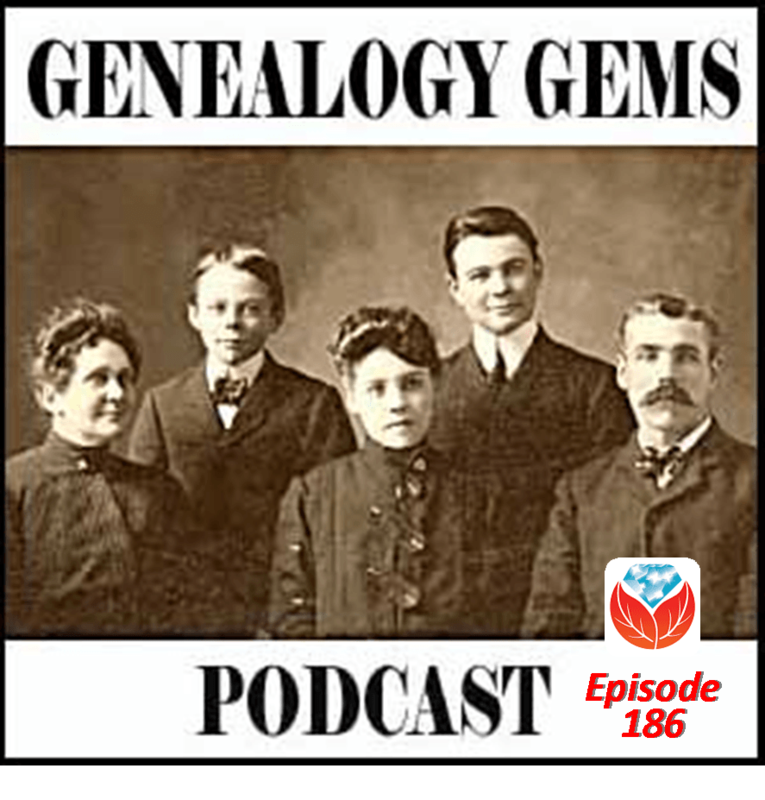 On the show I shared two special poems that have come in on the Genealogy Gems voice mail. You may recall from last month’s episode that we have invited everyone to write their own version of poet George Ella Lyon’s “Where I’m From” poem. Between now and the end of the year, I encourage you write your own poem. Just make a list about where you’re from—the places, people, sights, sounds, smells, tastes, phrases, songs and rhythms that are part of your story. Shape it into a poem. Then call in to share it with us on our voicemail at (925) 272-4021. Those who do so by December 30, 2015 will be eligible for a chance to win a one-year Genealogy Gems Premium membership or renewal. Next month, I’ll share a couple more of your entries on the podcast. Give it a try! Click here to learn more about this contest. Cluster research, in which you try to recognize little migratory groups and use other members of the group to learn more about your own ancestor of primary interest. It’s a concept that Contributing Editor Sunny Morton wrote an entire how-to class on. She gave some great tips from that class in the November 2015 Family Tree Magazine podcast, which I also host. 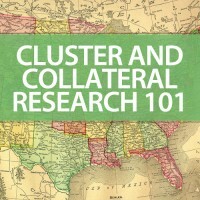 That brick-wall-busting class is called Cluster and Collateral Research 101. DNA testing. Depending on which test she takes, her results may lead to common relatives descended from those “missing” parents. I recommended the “Getting Started” DNA guide I offer through the Genealogy Gems website. It’s an inexpensive and helpful way to start your DNA journey. As your DNA journey progresses, the entire series of DNA guides written by our resident DNA expert, Diahan Southard, can help with next steps. Kathy Hawkins is a music therapist and a Master Trainer for a program that works with memory-impaired adults. I asked her questions about aging and memory and how the severity of Alzheimer’s or dementia affect the quality of someone’s memories. We talked about strategies for asking questions that will elicit better memories, understanding the possible limitations of those memories and how to how to have more meaningful conversations with someone who suffers from severe memory loss. Cut out the phrase, “Do you remember?” Ask instead specific questions about “who, what”….etc. I’ve seen people shut down when they feel like it’s a memory test. Don’t put that kind of pressure on them. Your tone and your approach are so important. Don’t be sing-songy or condescending: they’re not a child. Treat them like an adult. The emotional integrity of someone’s story is still often intact, even with memory-impairment. The emotion attached to a memory or a person will likely be really sincere. But their chronology or details may get confused with other similar events that were also true. From the genealogy researcher’s point of view--whenever you can, verify facts (especially dates) with other sources. Don’t make everything about what they remember (or don’t). Be interested in who they are now: their thoughts and creativity. Kathy shared information about Timeslips Creative Storytelling, which teaches caregivers how to have more meaningful, joyful interactions with memory-impaired loved ones. Click here to see a pdf with some creative storytelling and arts materials that Timeslips offers. This month, over on the Genealogy Gems Premium podcast, our Premium members will hear an exclusive interview with Lalita Tademy, author of Citizens Creek. In this episode, we also play a brief excerpt for you. If you’re enjoying these snippets of interviews and you’re not already a Premium website member, consider whether it’s finally time to take the plunge. With Genealogy Gems Premium website membership, one LOW price gets you an entire YEAR’s access to current and ALL back episodes of the monthly Genealogy Gems Premium podcast. That podcast is like this podcast—but on steroids. You get MORE meaty interviews, more fun conversations and exclusive, full-length interviews with the authors of our Book Club selections. You also have access to my most popular classes on video, which if you were to take them at conferences or purchase something like them from another web site would EACH be more expensive than the entire annual membership price. Why not try it for a year? Get as much out of it as you can—there’s definitely a year’s worth of materials to watch and listen to. At the end of the year, YOU decide whether to renew—I never auto-renew my subscribers. It’s always your choice to continue to enjoy Genealogy Gems Premium privileges. Earlier this year we related the story of Mary McPherson and her cousin Dolores Washington-Fleming who discovered a common connection through Peter Edward Williams. Mary is a descendant of his wife, and Dolores through his slave. Mary and Dolores welcomed this new connection and shared information about their common ancestor. As they reunited for the first time, perhaps they talked about what life might have been like in the 1850’s in the south, and how their ancestors would’ve never guessed that the two of them would be gathered around the same table. A similar story broke recently out of California. Just days old, Jen Chervin was found outside a hospital in Yuba City, CA. That was 40 years ago. But this year, Jen used the power of the genetic genealogy database in combination with some serious genealogy work to find her parents. While neither is in a position to openly embrace her as a daughter at this time in their lives, Jen now has a name card to place at seats of honor around her holiday table, all thanks to a simple saliva test. This has been a landmark year in my own family. In one seeming miracle after another, I have added the names of maternal grandparents and great grandparents to my family tree as DNA testing has helped my mom fill in some of the missing pieces in her life. We have had a true Texas welcome from some of her paternal second cousins, and an outpouring of kindness from a maternal second cousin. While our place cards for mother and father are only tentatively penciled in, I know as I look around our genetic holiday table, I am excited about the new faces I see and I can’t wait to learn more. If you want to get started filling seats at your table, there is no time like the present to give yourself, or someone else, the present of DNA testing! The first rule in DNA testing is to test the oldest generation. So parents, grandparents, aunts and uncles should be first on your list. If you are that oldest generation, then pat yourself on the back and get swabbing! The savvy shopper begins with the AncestryDNA test for all interested parties, and the YDNA 37 marker test from Family Tree DNA for all males. Then sit back and wait for the results to roll in! As they do, check back here at Genealogy Gems for tips on how to use that data to fill seats at your holiday table next year.